“The worst thing about Communism”, said dissident Polish intellectual Adam Michnik, “is what comes after”. 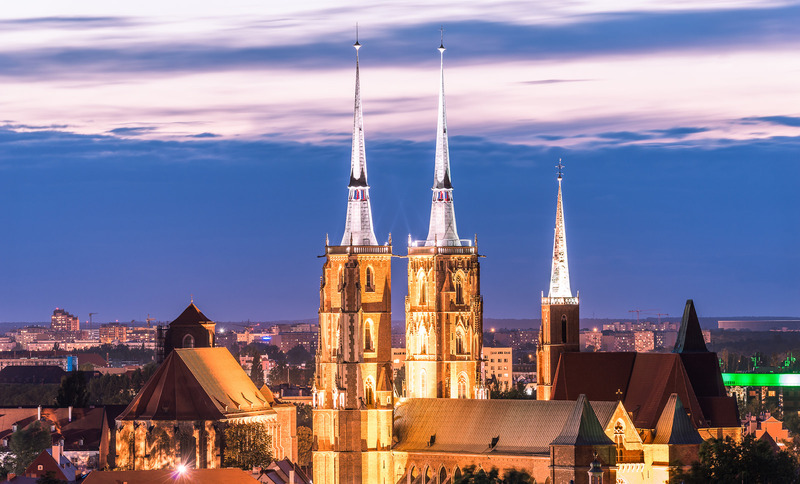 But Wrocław, western Poland’s largest city, roughly equidistant between Kraków and Prague, is hardly typical as a glimpse of the post-Soviet condition. Instead, exploring the city feels like taking part in an ongoing exchange with different versions of the past. 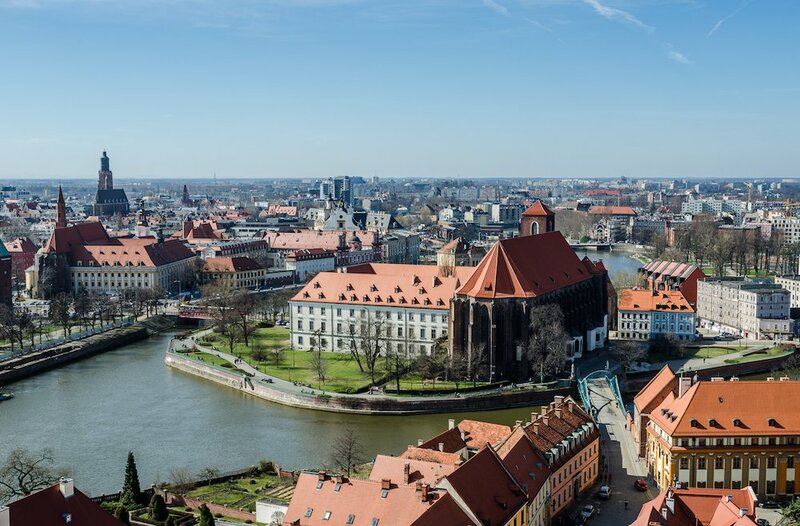 Having passed from Poland to Bohemia in medieval times, Wrocław became Breslau when it fell under Habsburg rule in 1526, before developing into a major centre of industry and learning under Prussia and then Germany. Half destroyed in the Second World War, millions of the city's remaining bricks were transferred to Warsaw to help rebulid it. In the years after the war, the German population was resettled within Germany’s post-war borders, and replaced by deportees from Lviv and other Polish territories annexed by the Soviet Union. 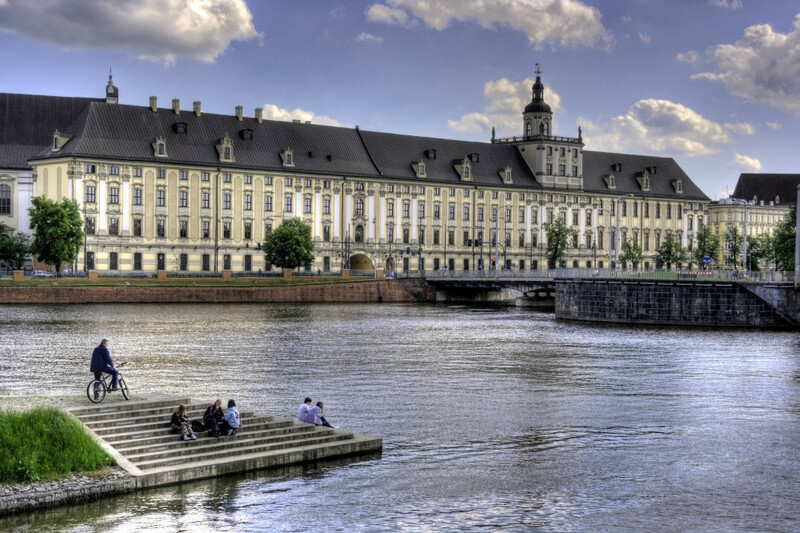 The result is that Wrocławian memories (individual or collective) do not go back very far. 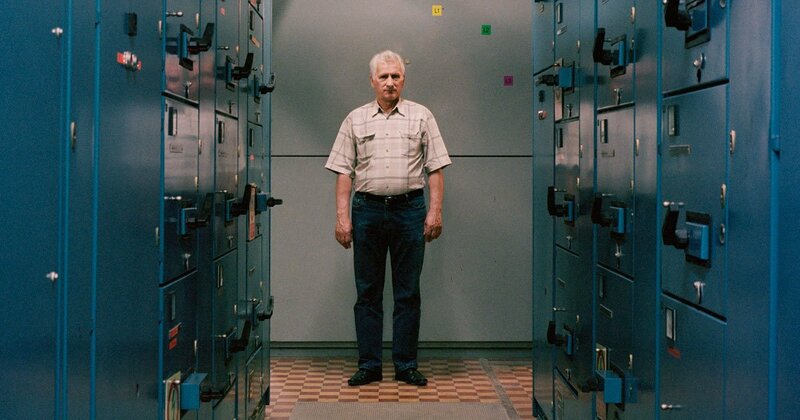 It was very difficult to find people to give testimony about life in Wrocław pre-1960, and it proved impossible to hear memories reaching further back than that. But there have been a number of restoration efforts in recent years. The Rynek, the daunting gothic town hall, and the brightly coloured townhouses that surround it, have been lovingly restored. And there are now memorials to the victims of the Holocaust, Stalinism, and the Katyn Massacre. There are, of course, few survivors, and few survivors’ stories as a result. The fashionable Four Denominations district nestles between the moat (the remains of the city’s medieval fortifications) and the Kazimierza Wielkiego (the busy ring road that coils around the old city). Plenty of cities now boast areas like this, ripe for ‘hipster’ culture and the rapidly rising property prices that come with it. It presents itself as alternative to the homogenous consumer culture you see around the Rynek and the shopping streets that lead up to it. But there is more at stake here. “Commercial culture flattens everything,” says one student as she drains a beautifully crafted iced-coffee, “But this is different. It’s an aesthetic revolution!”. It’s a confident assertion. 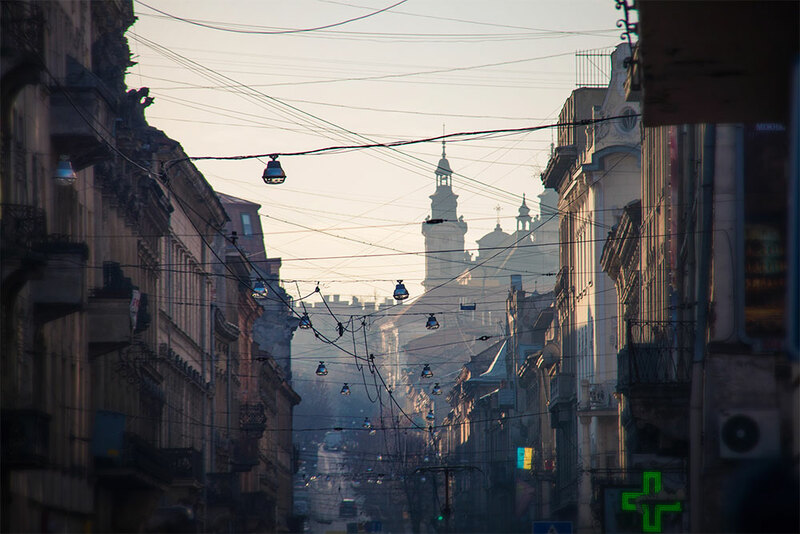 This part of town is stuffed full with the vegan restaurants and boutique coffee shops you might find in similar districts of London and New York, but there are plenty of places doing local fare (pierogi, borsch, goulash) with a modern metropolitan twist. There’s a non-nationalistic pride about the place, a sense that there are no natives and that everybody is from somewhere else. And it’s unusual that this isn’t a space ‘reclaimed’ from an old industrial heartland. It’s an assortment of grand old Germanic townhouses in various shades of brown. The roads are paved with elegant old stone slabs, interrupted every so often by the conventions of commercial architecture: soulless glass edifices bearing the name of one global firm or another. 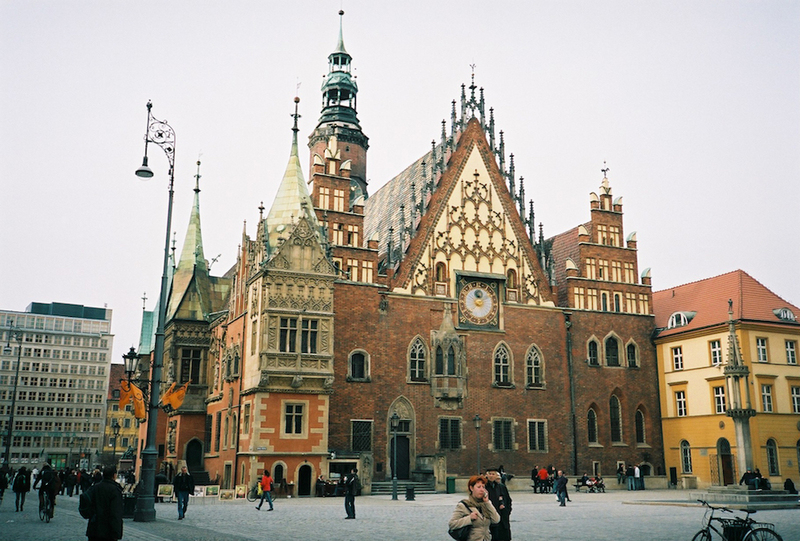 To the centre, Solny Plac, the Rynek, and the town hall are hidden behind the gloomy gothic façade of the old university library. To my left, the threshold between “ordinary” Wrocław and the Four Denominations district. Turn another left, and you’ll find mysterious stone passages and courtyards trimmed with chic bars and cafes. Carry on the ring road and you’ll find fancy modern hotels, a renovated cinema, and the glass frontage of the headquarters of a certain German telecommunications network. Only with views like this can you see the full extent of the overlap between old Breslau and new Wrocław, imperial Germany and modern democratic Poland, the socialist past and the entrepreneurial present. 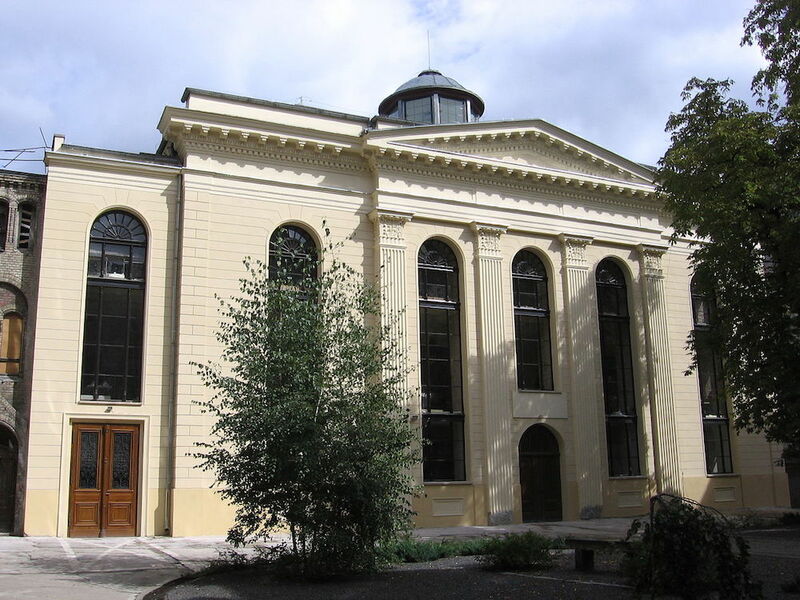 Turning a seemingly anonymous corner, I found the White Stork Synagogue, one of many that served a Jewish population that had reached more than 23,000 by the 1920s. On another, I discovered a courtyard shared by gallery spaces, art studios, and a jazz club with walls covered in the neon signs of former state-owned storefronts, recast as retro design. It is proof that you can’t just count up the historical facts here like they were beans in a jar. You have to sift through lapses of these memories, of what has been incompletely covered over by time and political necessity. 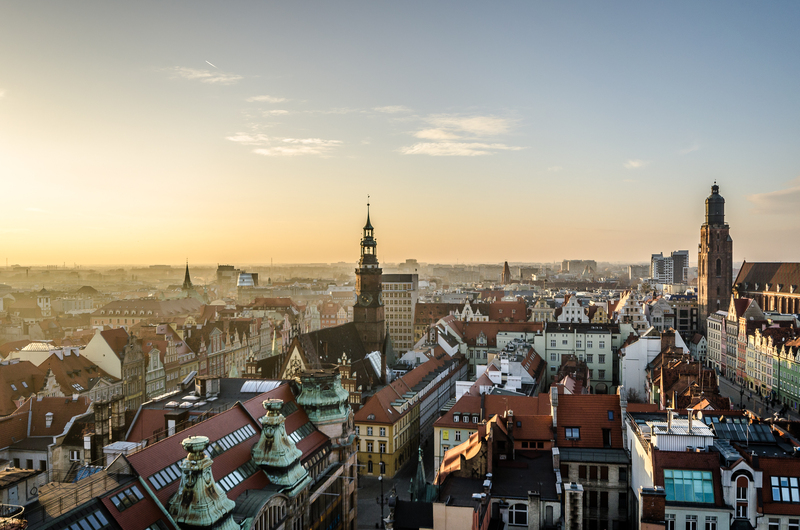 Today, Wrocław is open and cosmopolitan, subtly different to other Polish cities. Warsaw is gloriously ugly in stark socialist grey; Kraków is quaintly imposing with its winding gothic alleyways; this part of Wrocław shows there’s something else going on, but the future is far from certain. This “hatred” has been expressed by Foreign Minister Witold Waszczykowski in an interview with a German tabloid with a specificity that would be funny if it wasn’t so horrifying. He identifies as enemies of the people those who favour a “mixture of cultures and races”, as well as less likely targets – cyclists, vegetarians, people into renewable energy, atheists, and, by strong implication, homosexuals. Posters attacking the so-called “gender ideology” (an umbrella term adopted to attack all forms of feminism and LGBTQ movements) are not uncommon. 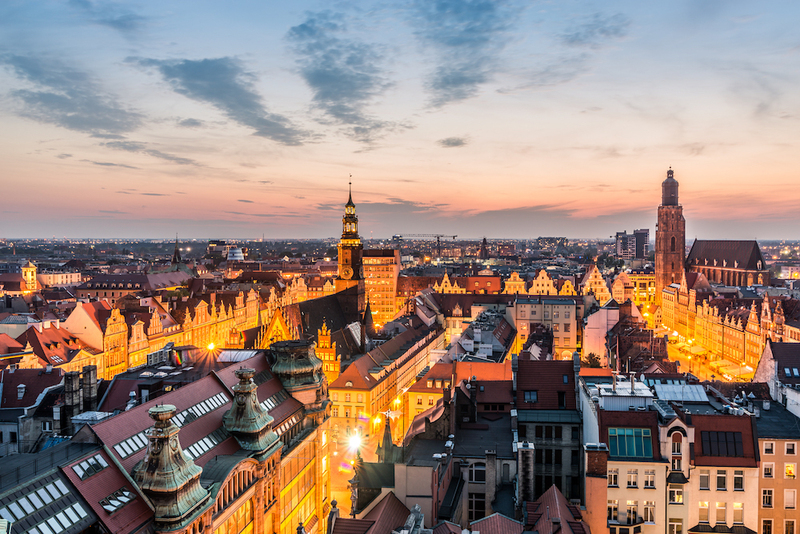 It turns out, then, that this district is a clear target for Law and Justice: a specific hub of liberal cosmopolitans who fail to conform to a distorted idea of “traditional Polish values”. Another move involves the Constitutional Tribunal, a term that has now reached the lips of even Poles usually uninterested in politics. The Tribunal concerns the high court’s power to challenge parliament’s decision on passing bills then found to be unconstitutional. Early on, the government refused to recognise the previous government’s nomination of two judges, changing the court’s power by attempting to install their own people. The result has been demonstrations both for and against the government. Then again, Wrocław is no stranger to this. The Orange Alternative began their challenge to martial law in the 1980s with absurd anti-regime graffiti and paintings of dwarves. The “socialist surrealist” group ended up mobilising thousands of young people to take to the streets dressed as dwarves (cone-shaped hats, waistcoats and breeches). The aim was to confound local law enforcement, ensuring they couldn’t be arrested without the regime looking ridiculous. 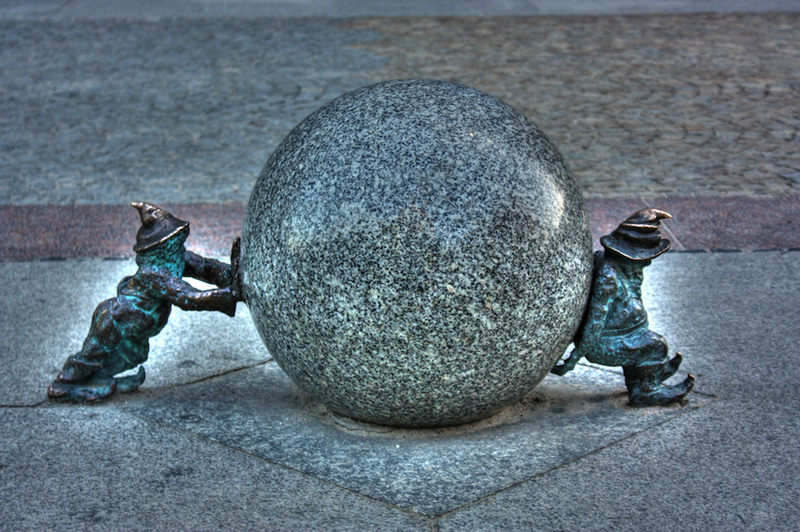 Since 2005, brass commemorative statuettes of the dwarves have stared to pop around the city. There are now more than 300 of them. As if responding to the radical spirit of Wrocław embodied by the Orange Alternative, October’s ‘Black Monday’ protests saw thousands of black-clad people take to the streets, challenging the Law and Justice Party’s attempt to pass a bill that would essentially lead to the banning of abortion. But Poland’s young democracy now faces the sort of challenges we see elsewhere. In Wrocław, I saw a military demonstration outside the local parliament building. Beneath the proudly fluttering flags of Poland and the European Union, the organisers had put up a screen playing military footage (marches, training drills, air strikes seen from the missiles’ perspective). At ground level, children clambered gleefully over tanks and armoured personnel carriers to a heavy metal soundtrack from a nearby stage. 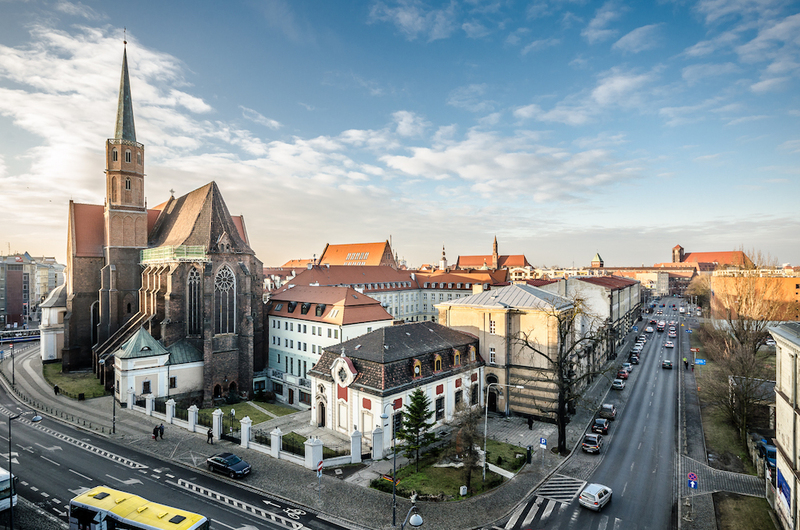 Wrocław is like a palimpsest, its history repeatedly made, scraped clean, remade. The Rynek, the dwarves, and especially the Four Denominations district represent the speed with which things can change. The decisions made by the current government will not yet have had a visible effect. They are not yet embedded in the fabric of the place, like the bullet holes that still scar some buildings. But they will become one of the many sedimented layers of identity and memory here.